If you trade online, or even if you just keep data on your customers, Cyber Liability Insurance can protect you against the implications of a data security breach. More and more businesses hold data on their customers and prospects, which could be at risk from hackers, cyber criminals, or even inadvertent loss or misuse of data by your own staff. Contact Us to find out more or to get a quote. What is covered by Cyber Liability Insurance? 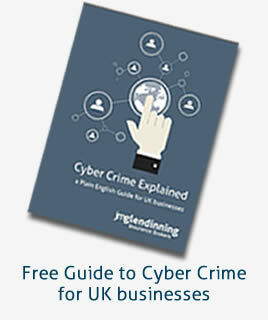 How do you protect your business against the threat of Cyber Crime? Whether you buy insurance or not, it’s vital that you review your IT processes and procedures, to ensure that you don’t leave yourself open to crime. There is a great deal of free help and advice available and many businesses find that there are simple, actionable steps they can take to improve their cyber security. Cyber Streetwise – This Government website gives simple, effective tips to both individuals and businesses to help them reduce the risk of a cyber breach. Visit Cyber Streetwise to find out more. Cyber Essentials – This new Government initiative is aimed at helping businesses improve their cyber security, as well as offering the new Cyber Essentials accreditation. This allows you to demonstrate to potential customers that you take cyber security seriously. Action Fraud – This is the UK’s fraud and cyber crime national reporting centre. If you are unfortunate enough to suffer a security breach, you should contact Action Fraud in the first instance to report it. Why should you use JM Glendinning for Cyber Liability Insurance? As an experienced insurance broker, established in 1972, we’re well placed to help you with new and potentially complex covers like Cyber Liability. JM Glendinning has always provided local, personal service, to help you find the right insurance for your business, at the right price.